Is your Sixaxis feeling left out from all the Wiimote charging stations you've been scoping out? 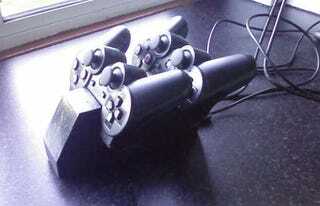 Now you can build one yourself for the PS3. All you need is some wood, USB cables, cutting blades and the ability to not hack your fingers off while you're working. On second thought, you'd probably be better off waiting for a pre-made one.